Frank Lampard is approaching the end of his career at Chelsea and, remarkably, his next destination could be Manchester United. At least that’s what readers of The Sun were told in a story suggesting that Sir Alex Ferguson was willing to offer the England midfielder a year’s contract in the summer. Given that Ferguson already has a couple of pensioners in his midfield, with Paul Scholes and Ryan Giggs, maybe he really is keen on extending his squad of geriatrics. Conspiracy theorists though might wonder whether he is floating the rumour just to make life even more difficult for his old enemy Rafael Benitez, currently presiding over a tricky period of transition at Chelsea. Benitez, already the object of fans’ antipathy, wasn’t going to win any new friends with his remarks about the need for understanding. "This year you can see is a year of transition," he said, "with some new players coming in, so it's different. Before at Chelsea you had a lot of big names – then you could manage a lot of different players. But new players have come in, while some players are getting older, so it's normal." If so, it’s a normality that Chelsea supporters are having difficulty accepting. Perhaps it’s a canny move by owner Roman Abramovich to bring in the hated Benitez to do the dirty work of shipping out the old favourites. At the Capital One Cup semi-final against Swansea, Chelsea fans brought a banner reading "Lampard is a legend" and demanded the player be brought on from the bench. 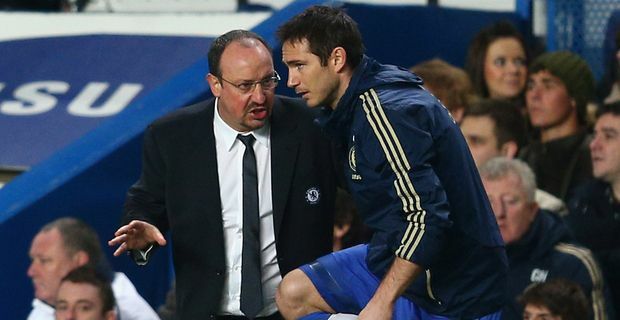 Benitez finally obliged, but too late to save Chelsea from a 2-0 defeat. Chelsea have a slim chance of making the final if they can overhaul the deficit in the second leg, although Swansea showed they are an impressive side. Benitez knows that a season of transition is always easier to accept if it includes some silverware.